It seems that a long time before the birth of Zombi, Gatekeeper, Nightsatan and all the other Carpenterphiles of the noughties there was a Snake Plissken appreciation-group running amok in pop-music. This 7″ single is from a american group from the early eighties (1983 to be precise) that blatantly took it’s name straight from John Carpenter’s masterpiece Escape From New York. 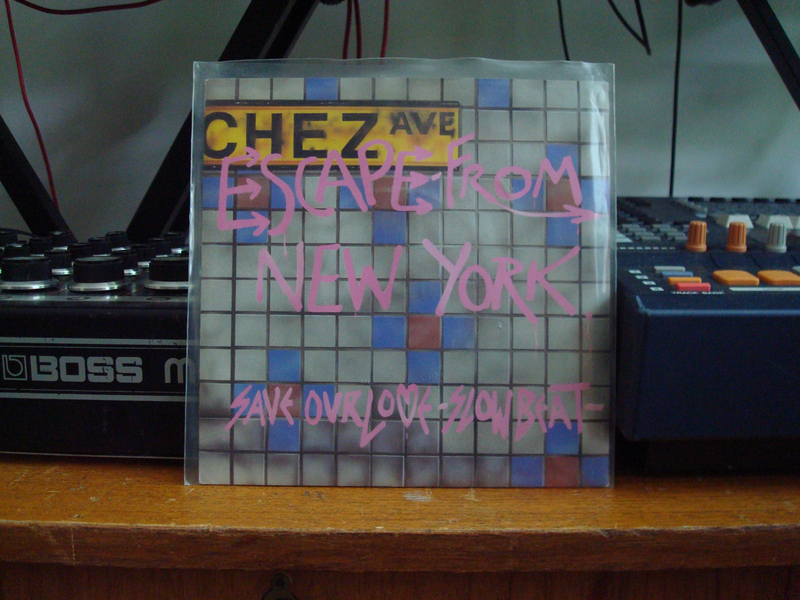 Save Our Love is the first of two singles put out by this group and I decided to include the instrumental version from the b-side, after all we’re supposed to be a synth blog, not an early-eighties-curiously-gay-disco-vocal-blog. Musically Escape From New York has very little to do with the movie of the same name. Save Our Love is disco, but not in the Philly tradition or any other american tradition. If something, Save Our Love has a very european flavour to it. Although at the same time the productions of one certain Bobby O. spring to mind from the very beginning. With it’s driving bassline and steady four on the floor disco beat Save Our Love is like the blueprint for the balearic/spacedisco -sound of today. Even though the single cover lists Save Our Love as “slowbeat” it would benefit from a further slowing down of around -15BPM. That way it would be basically indistinguishable from Studio’s or A Mountain Of One’s best monumental slowdisco-tracks. The instrumental version obviously loses the vocals but replaces them with some heavy delay on the guitar and synths and makes the track even more “now” than the vocal version. These guys were way ahead of their times not to mention their american contemporaries of 1983. I originally bought this seven inch for the band’s name, and after the initial dissappointment of not getting what I was promised, I have started to really appreciate the track. Further study into the subject has revealed, that “Slow Beat” was actually a whole other track by Escape From New York. It’s not included on the 7″ version of the single although it clearly says so on the cover.